Health Benefits Distributor Info Biomat Construction ORDER BIOMATS HERE! Biomats are infrared and negative ion therapy to the body by simply laying on them. The FDA approval of the Biomat ensures that Biomats do what Richway says they do, deliver these therapies. The only alternative to a Biomat is an infrared sauna which take up huge amounts of space in the home and cost a lot more money. The Biomat provides a unique, portable, low-cost delivery system for these therapies. Infrared therapy increases blood circulation, thus taking any unnecessary strain off of the heart. It detoxifies the body, thus leaving the immune system stronger and able to repair past damage to the body instead of fighting off a disease or sickness. It relieves muscle and joint pain and pain associated with major disease like diabetes, cancer, fibromyalgia, arthritis and migraine headaches. Below are all of the Biomats Richway has to offer. The Mini Biomat is Richway's smallest mat-form Biomat. It is made for versatility and portability. Its flexible construction makes it easy to wrap around your arms and legs. Its lightweight so you can throw it anywhere and use it. 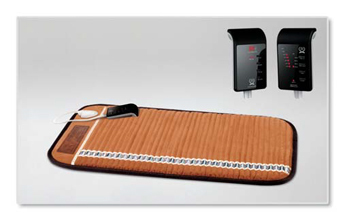 The Professional Biomat is the lowest-cost, full body Biomat Richway has to offer. It fits perfectly on healer's tables. Massage therapists, acupuncturists, doctors of all kinds will find the Professional to be their best option. The Single Biomat is perfect for those with single or twin sized beds. The Single is meant to be slept on every night. The King and Queen Biomats are meant for king and queen size beds. Each side of the King and Queen can be controlled seperately from the one controller. or email us at BiomatSales@hotmail.com for more details!